This Golden Teacher XL-MyceliumBox is an enhanced Mycelium kit with 80% more substrate. The Golden Teacher is one of our strongest and most visual mushroom strains. This is not a strain for beginners! This XL-MyceliumBox contains the mycelium of the Psilocybe cubensis 'Golden Teacher' strain. The Golden Teacher mycelium is colonized on a substrate of rye and perlite. The top layer is covered with vermiculite. 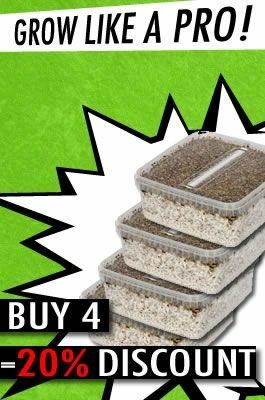 Our online manual for the mushroom mycelium kit can be viewed at www.mushroomgrowbox.org. Holding the double of the substrate, meaning the double of the expected Golden Teacher yield, the XL-MyceliumBox is an enhanced product allowing the formation of exceptionally big Golden Teacher magic mushrooms in an exceptional short amount of time. Made for the amateur mycologist, the Golden Teacher XL-MyceliumBox highly reduces the probability of contamination and it's simplicity of processes will allow you to better focus on the amazing formation of mushrooms bodies. Made with the strongest redefined strains, growing mushrooms was never easier and more reliable. If you do not want to start growing immediately after receiving the mushroom kits, the best place to store them is your refrigerator (not your freezer!). Do not store them longer than 2 months. If this will be the first time you use magic mushrooms, make sure that a sober friend is around to help you out in case you feel uncomfortable, sick or scared. Click here to buy our Mushroom Stopper. Our Mushroom Stopper, it helps you to get out of your trip. Great Kit - Speedy Delivery - 1 Flush Limited with the grow back however. Flushes 2 - 4 were very strong and yielded well within a pf tech thanks avlon team! Excellent product. Seem to be more potent when consumed fresh as opposed to eating after dehydrating. Week 4 but it's only white at top and bottom. Nothing growing. Very disappointing. lololol anyone can post reviews here?